The product remains widely used as low-fat beef filling in burger meat, including in school meals. But some consumer advocates worry that attacks on the product by food activist Jamie Oliver and others will discourage food manufacturers from developing new methods of keeping deadly pathogens out of their products. The beef is processed by Beef Products Inc. of Dakota Dunes at plants at Waterloo, Iowa, and in three other states. One of the company’s chief innovations is to cleanse the beef of E. coli bacteria and other dangerous microbes by treating it with ammonium hydroxide, one of many chemicals used at various stages in the meat industry to kill pathogens. “Basically, we’re taking a product that would be sold at the cheapest form for dogs, and after this process we can give it to humans,” Oliver said in a segment of his ABC television show, Jamie Oliver’s Food Revolution, that aired last spring. BPI, which once boasted of having its product in 70 percent of the hamburger sold in the country, has lost 25 percent of its business. McDonald’s has been joined by Taco Bell and Burger King in discontinuing use of the product, and the company is worried other chains and retailers will follow them. “It’s just a shame that an activist with an agenda can really degrade the safety of our food supply,” said David Theno, an industry consultant who has advised BPI and is credited with turning the Jack in the Box burger chain into a model of food safety after a deadly E. coli outbreak in 1993. He called the BPI process “extraordinarily effective” in making beef safer. Lean beef long has been added to fattier meat to produce the blends of hamburger meat that’s sold in supermarkets and restaurants. BPI’s innovation was to develop high-tech methods of removing bits of beef from fatty carcass trimmings that had previously been sold for pet food or animal feed and then treating the beef with ammonium hydroxide gas to kill bacteria. Ammonia is used extensively in the food industry and is found naturally in meat. The gas BPI uses contains a tiny fraction of the ammonia that’s used in household cleaner, according to the company. Ammonium hydroxide, a mixture of water and ammonia, is used in baked goods, cheeses, candy and other products, according to the International Food Information Council. The Food and Drug Administration approved the chemical for leavening, acidity control and other purposes. The ammonium hydroxide lowers the acidity of meat, making it inhospitable to bacteria. A Washington Post report in 2008 described a BPI plant in South Sioux City, Neb., as a technological marvel that could be the “key to a safer meat supply.” But the good publicity didn’t last. That same year, the documentary Food Inc., featuring authors Eric Schlosser and Michael Pollan, portrayed the ammonia treatment as typical of “high-tech fixes” that agribusiness giants use to ameliorate the public health problems that the filmmakers contended are created by industrial-scale agriculture. A 2009 New York Times story raised questions about the safety of the BPI product, citing government and industry records of E. coli and salmonella contamination of meat sold for school lunches. One of the company’s plants was barred by the USDA for a time from selling meat for schools. 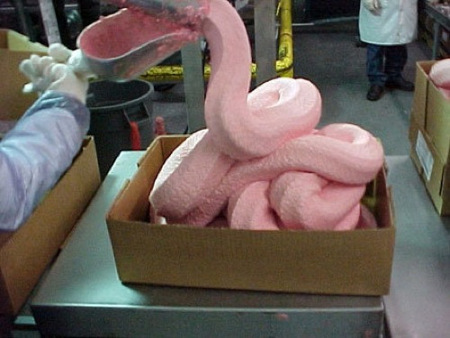 The newspaper story included a quote from an email in which an Agriculture Department microbiologist called the pale-colored product “pink slime,” a term critics seized upon. OIiver’s TV segment didn’t so much portray the product as unsafe as simply disgusting. “To me, as a chef and a food lover, this is shocking,” he said. Burger King issued a statement confirming that it was discontinuing use of the BPI product but was not clear as to why. “The decision to remove BPI products from the BK system is not related to any particular event but rather part of the company’s normal course of business,” the company said. McDonald’s and Taco Bell did not respond to requests for comment. BPI officials said they still have other fast-food chains as customers but would not identify them. Superficial fix or preventive process? Patty Lovera, who follows food safety policy for the advocacy group Food and Water Watch, said the BPI product raises legitimate questions about whether the food industry is relying too heavily on chemical washes and other technology to kill bacteria instead of doing more to prevent the contamination. Image from EASY BEING GREENer.